Early on during the 2018 Dizzy Fifties 50K Trail Run before things became difficult. This was to be an easy weekend, not a dizzy weekend, but car trouble had prevented me from running the Sky to Summit 50K the week prior, so I was still in urgent need of a long run. My race calendar showed one final race on the first weekend in December, the Chattanooga 100 Miler, but I hadn't been able to train much over the last 2 months. First, I took some time off from long distance training, instead racing some shorter distance races up to the half marathon distance on both roads and trails. The goal was to ramp up distance after a few weeks in prep of the 100 mile race, but that plan was thwarted with something that started as a minor cold, but turned into a 3 week struggle to regain my energy. During this time, I barely logged any runs. Fast forward to this weekend. This was now my last chance to see if I could even cover 31 miles running or if it would be a struggle from start to finish. If the latter as true, then I was likely going to pull the plug on the 100 miler in December, even if it wasn't going to be a goal race. Thankfully, I managed to get into the race via the waitlist. Race morning promised to be a cold one. The race course had been redesigned last year and to make things even more interesting, it had been reversed for this year's edition. 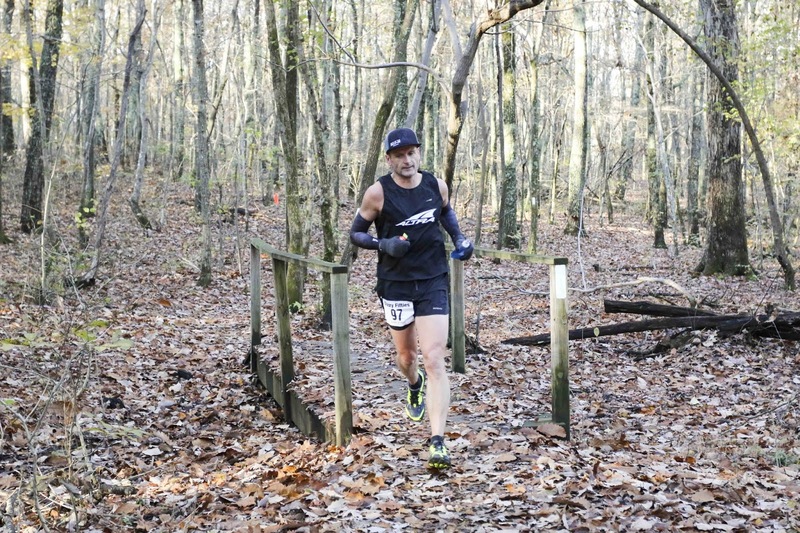 The race is run on Monte Sano mountain and consists of a total of three identical loops of single track trail with about 900-1000 feet of vertical gain per loop. The entry list looked promising and with the given weather conditions, it was easy to predict fast finishing times. While I knew that I was neither in the position nor in the condition to compete for a podium when looking at the field of my fellow competitors, I still managed to forget that fact as soon as the race started. After starting out slightly ahead of my goal pace (read: too fast), I settled into a more reasonable pace towards the end of the first loop. I was running somewhere around 8th or 9th place. I would make up a couple of spots on the second loop before losing these two spots again to different runners on the final loop, finishing in 8th place overall out of about 100 runners. The Dizzy Fifties course is very runnable. In fact, the entire loop is runnable, if one manages a sustainable pace. The first 6 miles in this year's direction are rather fast, rolling through the state park with little vertical gain or loss until runners hit the only aid station aside from the start/finish line aid station. Once we pass this aid station, we drop down the Sinks Trail for a fast one mile descent. After that runners immediately tackle the first and steepest of two climbs before continuing running on rolling single track around the memorable Stone Cuts before returning to the start finish area. I managed to sustain a solid pace for the first lap and while I dropped pace on the second loop, I was still on track to run my third fastest 50K ever. That was, until fatigue started to catch up with me in the form of severe muscle cramps in both my quads and my calves. Add to that a painful toe stub followed by a hard fall and you know how the third loop turned out. My pace slowed significantly and in the end, I was lucky to hang on to my 8th place finish in 4 hours and 43 minutes. The Dizzy Fifties is a well organized event and a fun race for first timers and veteran ultra runners alike, thanks to the efforts of RD Ryan Chaffin and his crew of volunteers. The course was extremely well marked, never leaving any doubt where to go. The most challenging thing were the fallen leaves hiding rocks and roots. However, this same fall foliage is also what makes this race course and the state park so beautiful this time of year. Do yourself a favor and sign up next year and be sure not to wait until the last minute. You wouldn't want to miss out.